Even though I’ve lived in San Diego for 8 years and LEGOLAND California is only about 30 miles north (in Carlsbad), I must confess that I didn’t visit LEGOLAND until very recently. It just seemed too kid-oriented and expensive. 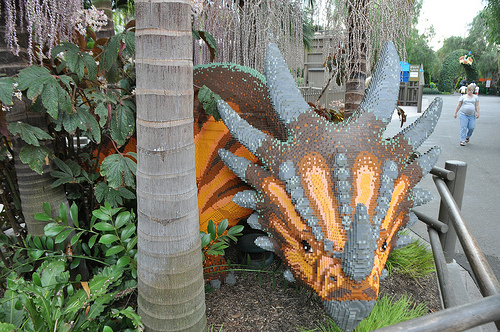 I was wrong, and I’ve really enjoyed my three subsequent visits to LEGOLAND California (LLCA) in the last 6 months. So, I decided to use my proximity to LLCA to give our readers a sort of combined review and visitor’s guide, mainly for adult LEGO fans. Hopefully there will be enough stuff here for new fans, lone adults, parents and even skeptics like me. Cost is still the one area where I still have some reservations about recommending LLCA. Alas, parking is not free. Basic adult admission is $67 (the LLCA website has a full breakdown of admission prices). You can buy tickets either at the gate or online. If you or your kids also like sea critters, the SeaLIfe Aquarium is immediately to the left of the entrance. SeaLife does have cool LEGO models inside some of the tanks. Customer service is at the right of the entrance, if you’re interested in a shopper pass (more on that later) or need special assistance. There’s also a customer service window inside and on the right next to the Big Shop. The park itself has a few areas with steps, but is generally level and steeper slopes have alternate easy paths for those with strollers or wheelchairs. The park itself is roughly circular, though there is more to the right of the entrance (north). Miniland USA and a pond are in the center of the park. 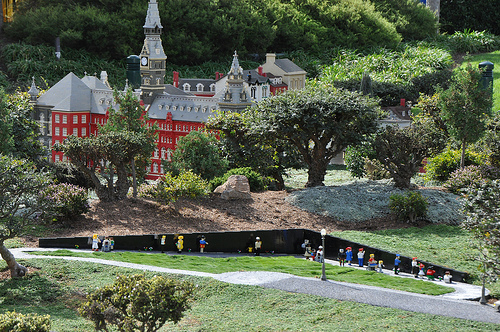 Miniland truly is the heart of the park, both physically and as the place where most of the creative energy (and maintenance) inevitably goes. It’s well worth skipping sections to go to Miniland, and then coming back again later. There’s a lot to see and you’re likely to notice something new each time you take a look. So even though I put it last in my preferred way of navigating around the park, it may not be something you want to leave to the very last. They’re also frequently adding new elements to Miniland, in fact when I last visited in mid-November, they had just added the Vietnam Memorial (below) to Washington, D.C. — just in time for Veteran’s Day. For simplicity of navigating, I’d go around the park clockwise. From the entrance, go left to Dino Island (sample pic below), Explore Village, and then Fun Town. As you go around to the left, there is only one way around, but after the Brick Brothers store (really!) in Fun Town, you have more options. I would go around the exterior, far left path through Pirate Shores to Castle Hill, then onto the Land of Adventure and Imagination Zone. Finally circle back through Miniland, and then back toward the entrance. The LLCA website Park Map page (link by clicking on the map below) gives several options for detailed maps including a basic color map, a printable map and also an interactive map, which are all useful in their own ways. If you’re going to eat the trapped tourist food inside any park, this is the place to do it. The food is expensive, like in any park, but much better quality than any other park I’ve been to, including the other big nearby ones. The Marketplace just to the left of the entrance has coffee and good picnic supplies (deli cheese! ), which are good for keeping you going. There’s a pretty good variety of food throughout LLCA though very little Asian or Mexican food. There are especially good Italian, cafeteria style, barbecue, burger and pizza places. The Fun Town Market is cafeteria style and has the added bonus of a mini museum of LEGO and cool creations by LLCA designers in the display cabinets. Each place has good vegetarian options and is of course very family friendly. Garden Restaurant is the most health-conscious of the food joints. If there are picky eaters or those with specific dietary restrictions, it’s worth checking out LLCA’s own dining options description. Most of the stores in LLCA have particular specialties. The Studio Store carries mostly licensed themes. The Pick-a-Brick (PAB) is in the LEGO Club House. The store in the Castle Hill area carries an extensive Belville selection, so if that’s how you roll, that’s where to go. The Imagination Zone is where most Bionicle is tucked away. The Big Shop right next to the entrance has almost everything, though they do struggle to keep the most in-demand items in stock, which is a bit of a shame. The LLCA website has a handy breakdown of the shops and their main specialties, especially good for someone mainly headed there to target specific themes to buy. You should know that the PAB at the LEGO Club House works differently from most other PAB. At LLCA it’s based on weight, rather than skillful packing of a cup, so in some ways you can score better elements at a more or less flat rate if you know where to look. In other ways, though, it eliminates the adult skilled-packer advantage, viciously allowing little children to buy at the same rate as adults. The Club House always has a separate minifig (with hat & accessory) PAB of 3 ‘figs for $15, usually populated by City ‘figs and accessories. If you want to go to LLCA just to go to some of the shops (LLCA has the only LEGO Stores in San Diego), you can go to the customer service window to the right of the entrance gate and get a “shopper pass.” You just turn over your credit card info and they give you a pass to let you in the park to shop for an hour. If you return in that hour, all your credit card info will be returned to you. If you use your free shopper pass to visit the park for a few hours, you’ll be charged for admission, so watch your clock. If you spend more than $20, take your receipt with you to check out at customer service and you can also get your parking reimbursed, so if you do everything right, you can park without any of the costs associated with a regular park visit. Rides are indeed kid-oriented, so don’t expect a Six Flags type thrill, but the good thing is that models are littered throughout the park, including in lines and in/around the rides themselves. It’s worth remembering that though the park is designed for kids, it was designed by adults who had to keep themselves entertained during the design and building process, and like any good children’s attraction, they knew to pack in some details that the accompanying adults are more likely to understand and appreciate. Safari Trek has life-size animal models that you might especially enjoy just before or after a trip to the San Diego Zoo or Wild Animal Park. Fairy Tale Brook and Coast Cruise are gentle little boat rides, but are the only way to see some pretty impressive models close up. I also enjoyed the random 2-year-old turning to me on the Coast Cruise and triumphantly saying, “I’m on a boat ride!” I felt the same way, kid. I felt the same say. The Adventurer’s Club just off Fun Town Square has very cool murals with some subtle and not so subtle touches that younger visitors might not get. There’s also an entire wolf family that’s quite impressive and dramatically lit. The Pirate Shores area is chock full of silly irreverent things. The mini golf course also has an impressive array of life size animals. Slightly higher than ground level, the shiny, partially transparent scarab beetles at the Beetle Bounce in Land of Adventure are really neat. The day I went to visit LLCA, I was also lucky enough to have an official behind-the-scenes wander and interview with Gary McIntire, one of the LLCA Master Model Designers (an upcoming feature). 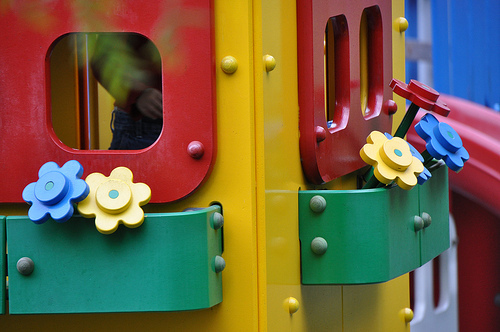 Some of his favorite things that he thinks people should keep an eye out for are the giant versions of real LEGO elements, like the flowers (right) and life-size original DUPLO farm playset in Fun Town, as well as the truck coming out of the Club House. Mention of Gary reminds me: One of the other highlights is the Model Shop, which is just next to Miniland. You can watch the Master Model Designers at their work, doing scandalous things to LEGO to make those phenomenal installations. I hope y’all have a chance to visit, and that you have a great time. As I write this in early January, it’s 70 degrees here in San Diego. What the hell are you doing in the frigid North? I posted a few pictures in a photoset on flickr, feel free to peruse. Most of the installations I mentioned throughout the article are in there. $67 Dollars (€46) for one person, one day? That seems horribly expensive to me. I mean, it’s no doubt worth it for the LEGO fans and whatnot, but… jeez. LEGOLAND Deutschland appears to be about a tenner cheaper (in Euro’s), but still steep. Well… like I said, no doubt well worth it, and it couldn’t have been cheap designing all the models for it, so it’s a necessary “evil”. Great round up. My favorite restaurant is Ristorante Brickolini – brick fired pizza, never seen that in an amusement park. 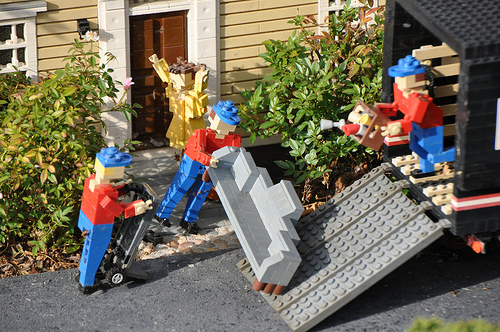 There are many ways to get discounted admission to Legoland. Costco sells an adult park hopper ticket for $60 (includes LL Sealife and a round of minigolf). And many restaurants like Sammy’s Woodfired Pizza offer discount coupons as well. The best bet for SoCal residents is the occasional deal at LEGO stores, buy $75 worth of LEGO and get a kid’s annual pass to Legoland for free. If I were to go, I’d use my ticket included in the BrickMaster subscription, which is only $40. One thing I would add, if you sign up for brickmaster, you get a free ticket. Which then covers the cost of the brickmaster price. When we went, I signed both my wife and myself up. And now I get two brickmaster sets too! My wife and I went. We did not go on many of the rides, as she was pregnant and we still had barely enough time to see the whole park. I don’t know how people could do it all in one day with kids. I would skip the aquarium thing though. The extra price isn’t worth it. Save your money and hit Seaworld or something else. We only went because if you spent $100 in the shop, you got two free admissions. @ Melfice: Like I said, the entry cost is my greatest reservation. @ Nannan & Athos: Thanks for the BrickMaster suggestions. 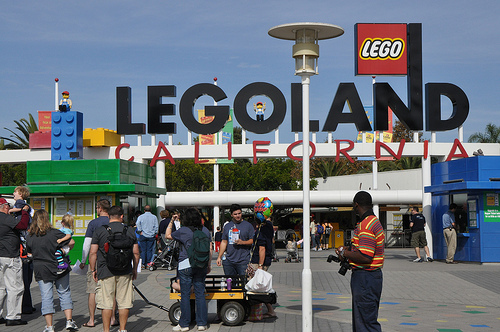 I went to Legoland this past Nov. A few things ruined my visit; the price tops this list. Way overpriced for Legoland has to offer. Miniland (the MOC’s). Now, yes its outside, yes stuff will get dirty…but it was sort of reridiculous. To say it was dirty is being kind. To the builders credit, it was amazing. The suttle jokes hidden with in the builds, the amount of detail was almost worth the trip. The last thing that got to me, the lack of Lego sets available. There wasn’t anything worth wild to buy. I was hoping a Toy-r-Us size store with rare and hard to find set that you can only get at Logoland. But, the rather small shop in the front of the park, offered stuff you can find everyday at Target, Toys-r-Us, or any Lego Store. I think that was the buggest disapointment for me. If i have to go back, i’ll being my brother’s kids so i can go on more rides. ^ The cost, marginal shop selection and deferred maintenance are definitely my remaining hangups too. The first two things I hinted at, but I guess I did overlook the model maintenance. Probably because during my most recent wander I’d just talked to the people at the Model Shop about that nightmare, so in cutting them some slack I may have cut LLCA a little too much slack. The long and the short of it is that they have two & a half people doing all the model repair, refurbishment and replacement for a park that’s open year round in the SoCal sun. LLCA probably should have more people doing it, at least two full time positions. It would be great if the shops did a better job of keeping high-demand sets in stock, and particularly if they had a few LEGOLAND exclusives, though those are quite expensive to develop and distribute. My kids love Legoland and we’ve gone there the last several years. The best deal that I’ve found for tickets is buying a 3 month pass from Costco.com (you need to be a member). An adult 3 month pass is $70 and $60 for a child. It includes both Legoland and Sealife. You also get unlimited miniature golf at Wild Woods. My kids are too young and was disinterested half way through. My kids also like the various shows they have including Journey to the Lost Temple. They encourage kids to participate in the show and it’s a lot of fun seeing your child on stage. We usually stay at the Grand Pacific Palisades and if you’re staying there you can walk into Legoland from their back parking lot fence, saving $12 on parking. The Sheraton on the other side has their own private entrance but GPP is more family oriented. I was just at the park for “Kid’s New Year’s Eve” with party, countdown, fireworks etc at 6pm. Lots of fun. I’ve been to the park a few times in the last year and a half, and I would certainly agree with your assessment and the above comments. My main concern is the maintenance issue. Considering Lego is the theme, I think they should place a higher priority on this, but there is nowhere to comment on this at the park. I also think there is a bit of a lost opportunity wrt Lego merchandising. I can understand why the Big Shop doesn’t carry a lot of the smaller sets, and it does usually have a good selection of the bigger ones (but no Mindstorms!). I can live with this, but all the other places in the park that have all the usual theme park junk often don’t have much Lego. These areas are perfect for impulse sets and other smaller sets. I’m sure the powers that be think this would cannibalize the bigger purchases people make on their way out, but I would bet it wouldn’t make much difference (otherwise the other junk would likewise cannibalize sales, and you don’t see that happening). I would think they could have more areas to build or play with lego, but these seem somewhat neglected also (my bet is they aren’t revenue generating so why bother?). As for this last point, I would point out that they recently opened the xbox area where you can play Lego video games. Great, BUT, they removed a build and test area to do this (you could sign out a Dacta/Education kit to build a model with battery and motor). That was last spring, and no sign of them putting the education builds anywhere else since (though they do have room in the build and test building). My son did enjoy the mindstorms session which was 45 mins, but this too has so much more potential. The builds are prebuilt, and they basically tell you what to do to program the (RCX!!) brick. Once again I think lack of revenue generation is the likely culprit in the neglect or lack of update (eg to NXT). I still recommend a visit but skip anything with a long line and you’ll have a better time. btw AAA sells tickets that get you an extra day within 9 days, and Costco (online only) sells a 3 month membership that is the best deal if you plan to spend more than one day in the park (includes Sea Life).